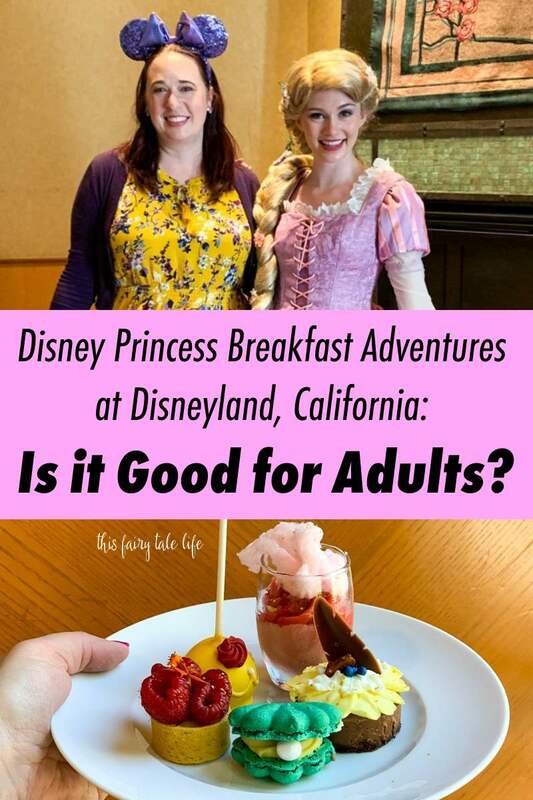 Disney Princess Breakfast Adventures - Is It Good for Adults? 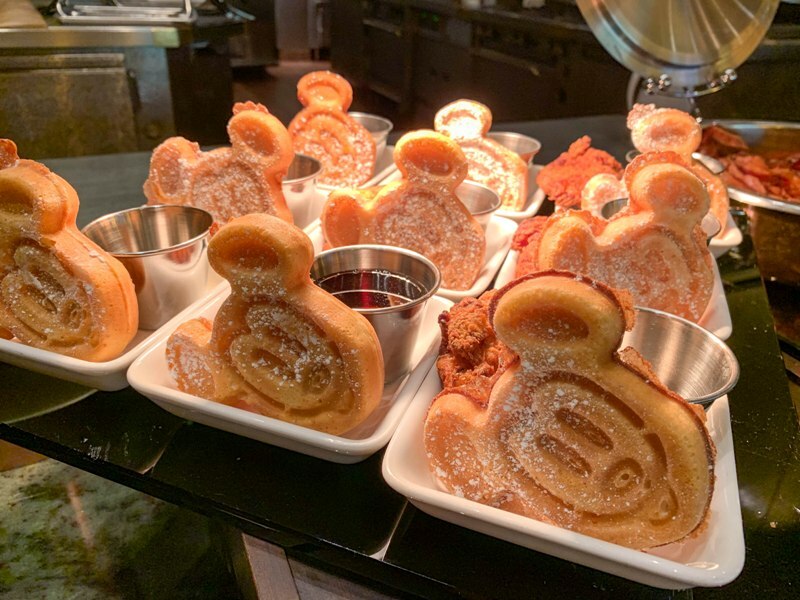 There’s a new character dining experience at The Disneyland Resort! Disney Princess Breakfast Adventures offers guests an unparalleled experience with several Disney princesses and scrumptious breakfast at one of the best restaurants at Disneyland. 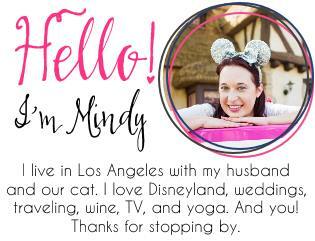 My friend Casey from Disneyland Daily and I dined here on opening day as two grown-up, Disney-loving adults. 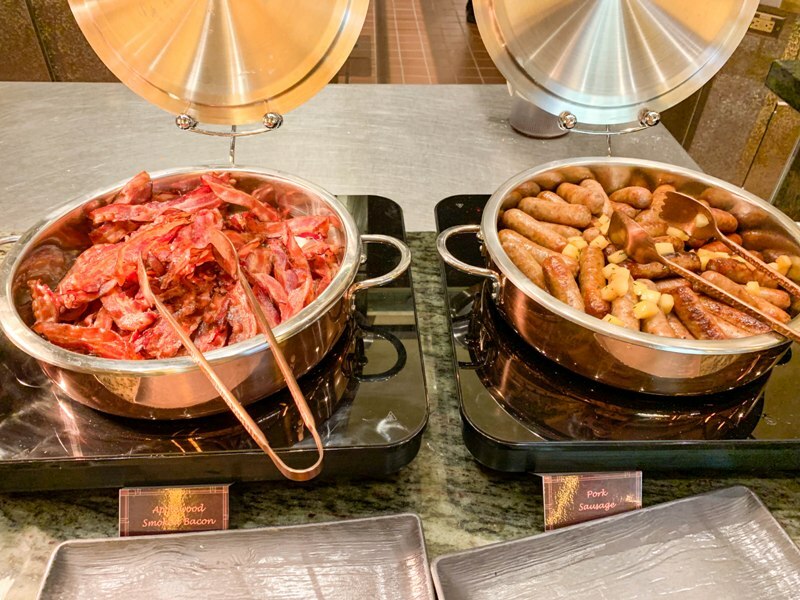 We did not have any kids with us and wanted to see how the breakfast experience was for adults only. 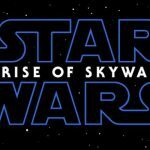 In summary I’ll say we had a great time, despite a few opening-day hiccups which I’ll explain as we go along. When: Every Thursday through Monday, from 8am to noon (last reservation time is 10:40am). Price: $125 per person over the age of 3. This does not include tax and gratuity. No Annual Passholder or DVC discounts. Ages 2 and under are free. – This location does not require a park ticket. 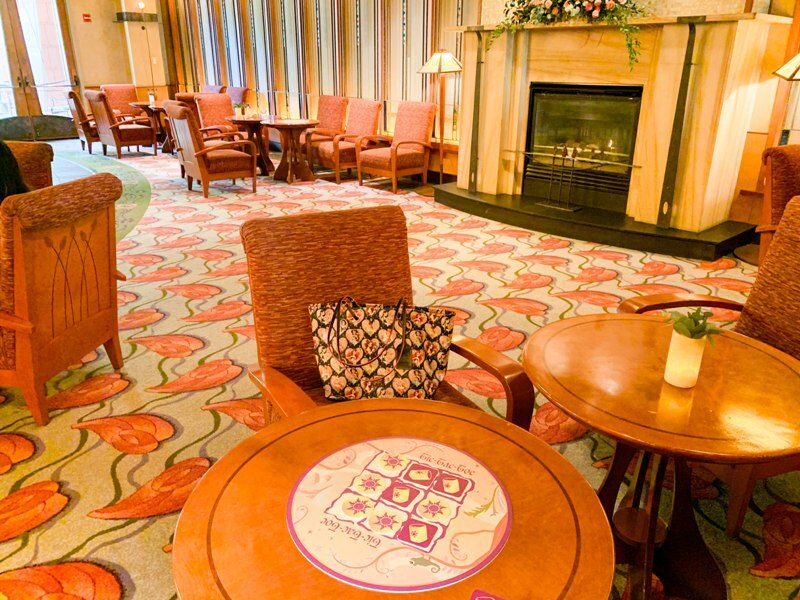 – You get 5 hours of free valet parking at Disney’s Grand Californian Hotel. – Expect your meal to last between 90 minutes and 2 1/2 hours. I recommend making a reservation for no later than 10am. More details about this below. 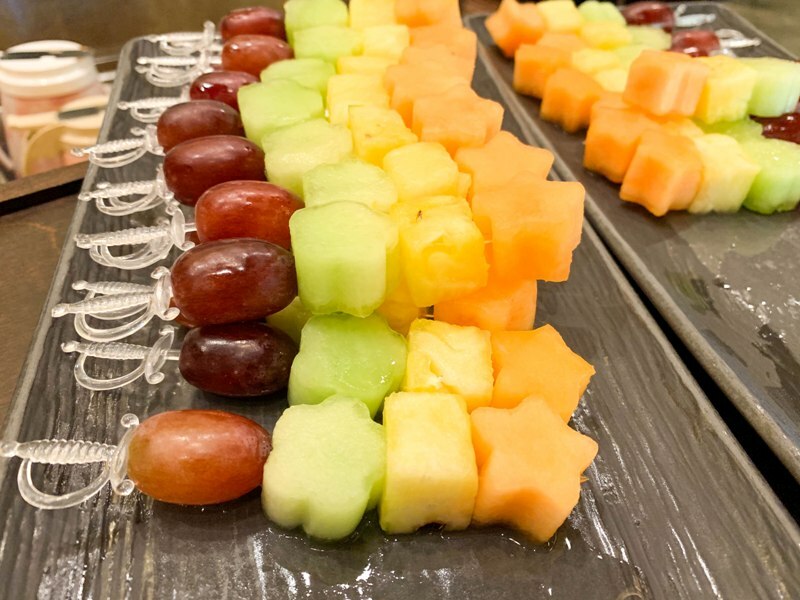 – This is a premium character dining experience. 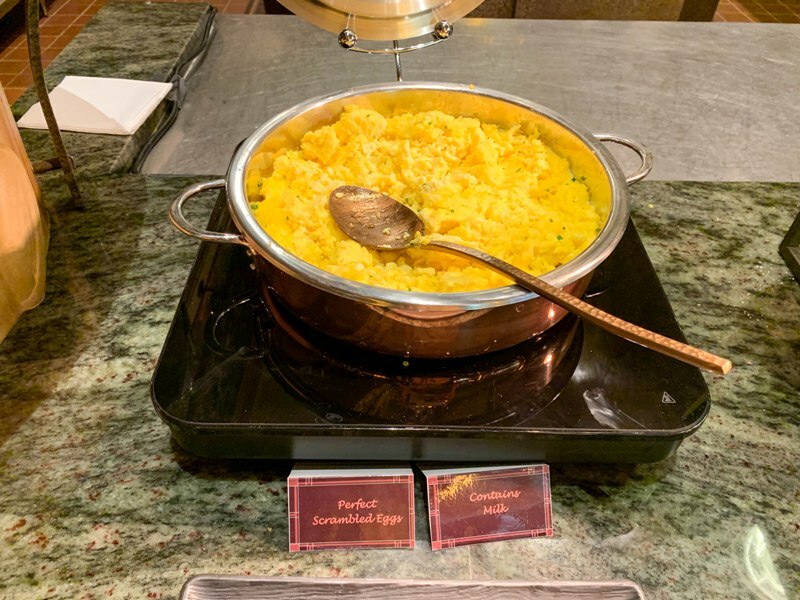 I have seen lots of raised eyebrows at the price, especially when compared to a meal at Goofy’s Kitchen or Plaza Inn. This is the best food I’ve ever had at a character meal, and the princess interactions are plentiful. – Your experience may vary from what you read here, and even may vary from the table next to you. It’s impossible to give every single every guest the same exact experience with so many detailed and moving pieces here. A “go with the flow” attitude will serve you best. 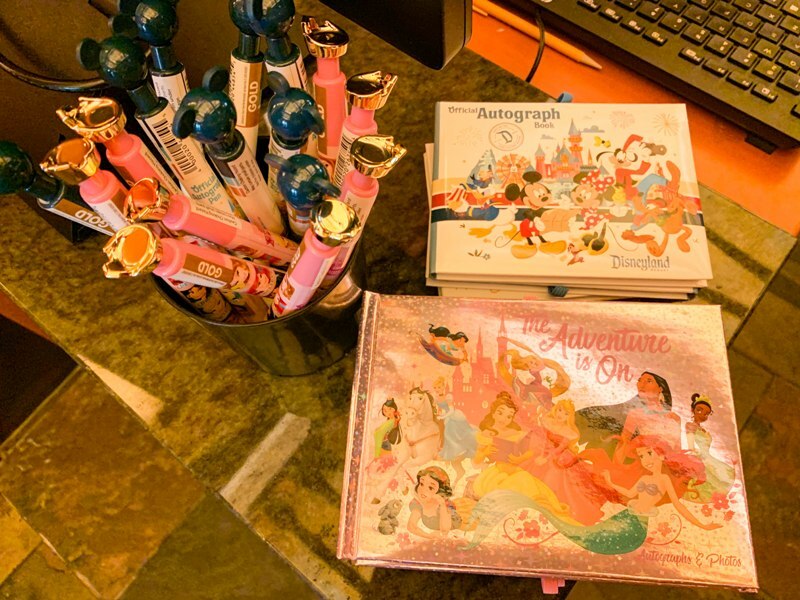 When you arrive, check in at the host stand and kids will receive their autograph book and pen. Kids can choose between two designs – one is pink princess and the other is blue Disney characters. There are pens to match. The host should ask which book and pen each kids want and not assume girls want the princesses and boys want the other characters. If you are given a design and your kid wants the other design, you can request it. NOTE: We were told the autograph books are only for kids over 3. If you have a kid who is on the cusp of age 3 and will get jealous the other kids have autograph books and they don’t, you can try asking for one. The host will probably oblige. Adults (even a group of adults without kids) do not get autograph books. After checking in, we were led to the lounge to wait for our table. Each lounge table had a Tangled themed tic-tac-toe game. Just as a side note, we waited over 40 minutes for our table. At around the 30 minute mark we were offered champagne or apple cider (and apparently we should have been offered this when we first arrived). Also, during our wait in the lobby we did not see any princesses. Towards the end of our wait, Jasmine came out and started interacting with the family next to us, and shortly after we were led to our table. 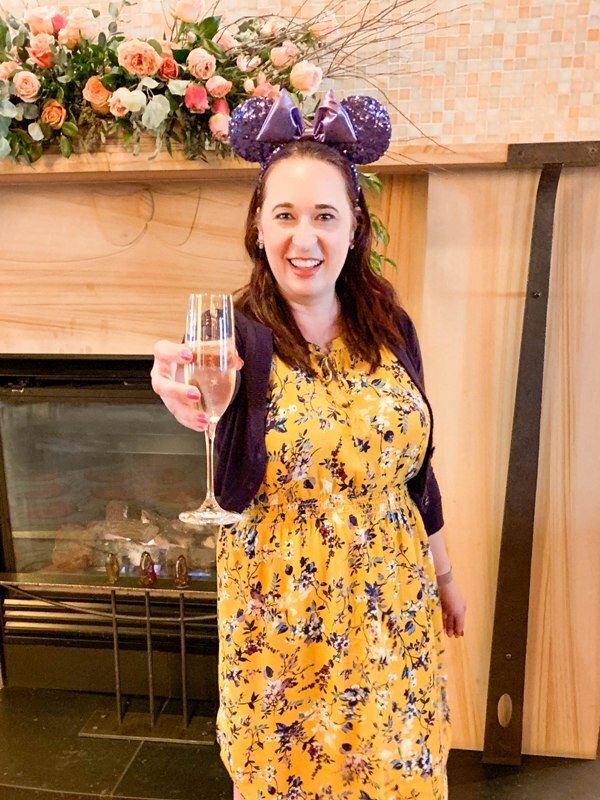 Media previews made it seem like there is always a princess in the lobby greeting guests, and a server with a tray of champagne for adults. Your experience may vary. NOTE: The meal includes one glass of champagne for adults. Additional alcoholic beverages may be purchased. Once we were seated, we were approached by Neaty, our “adventure guide.” Neaty was absolutely lovely and attentive. 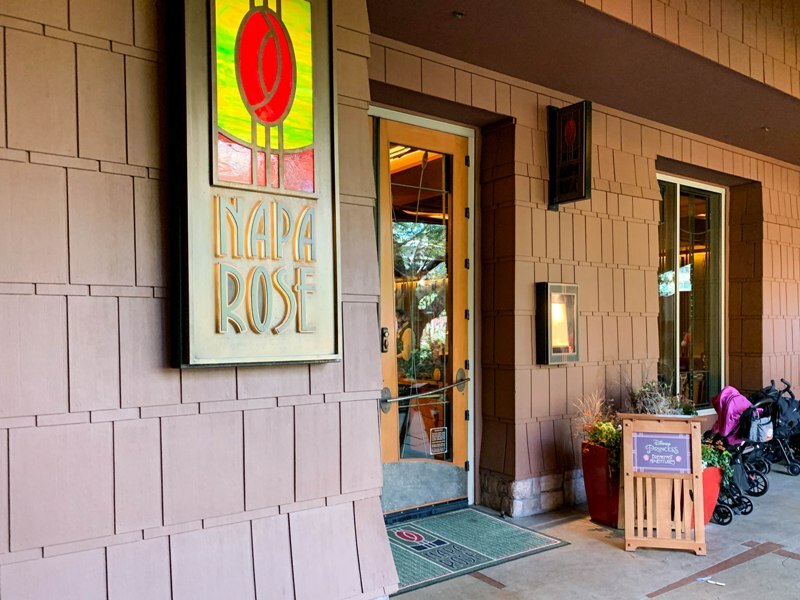 Every “adventure guide” we encountered at Napa Rose was wonderful. Neaty first brought over a display of specialty bread which included a scone, a cinnamon bun, and a pull-apart lemon bread, along with lemon curd. 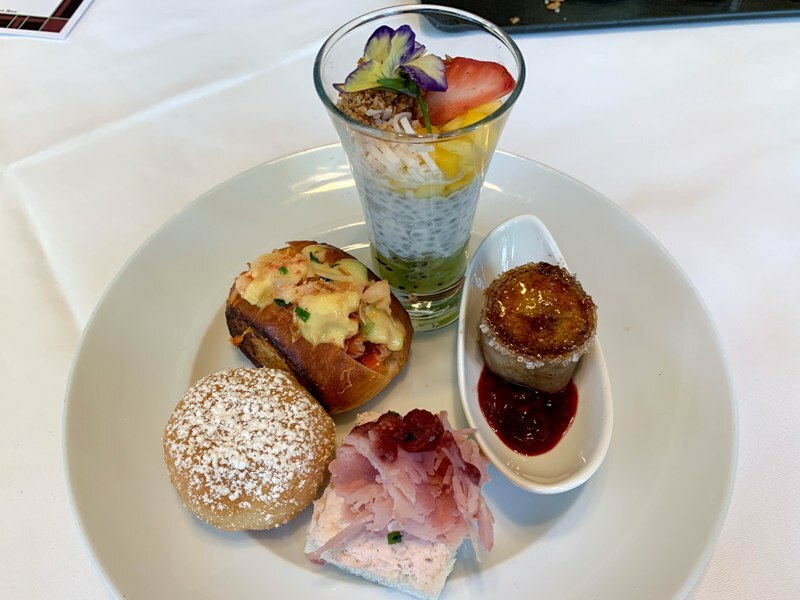 A really delicious starter! NOTE: It sounds like some people also received a fruit platter along with their bread. We did not. We were also provided with the “Royal Morning Libations” menu of alcoholic and non-alcoholic specialty drinks. Alcoholic beverages ranged in price from $18-21, and non-alcoholic drinks from $7-8. 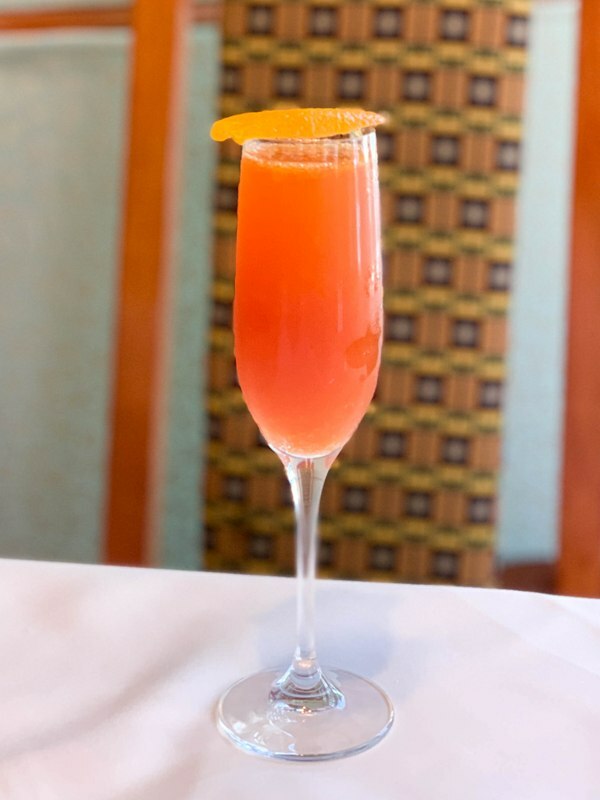 I tried the “Still Royal After Midnight” mimosa. It was really delicious; a unique mix of orange vodka, sparkling wine, and several fruit juices. Highly recommend! 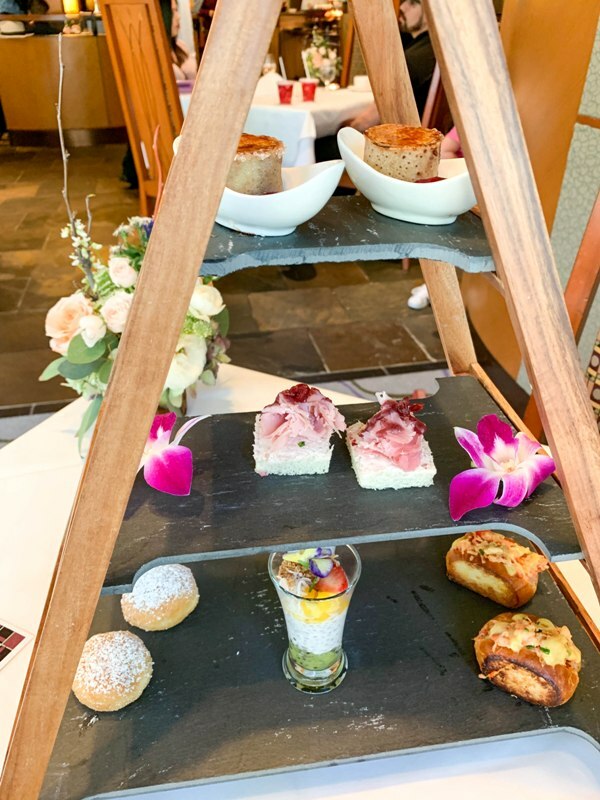 The first course is a delightful three-tier tray of cold appetizers. As Neaty explained, each item was thoughtfully prepared by a princess or her friends. The appetizers included: Abu’s Banana Wraps in a crepe with Nutella served atop berry compote; Tangled Ham and Cheese Sandwich with cranberry cream cheese and garnished with berries; mini Lobster Rolls on a thick brioche (at least they aren’t “Sebastian crab rolls”), Magic Carpet Parfait, which is chia pudding with mango, kiwi, and coconut, topped with granola, strawberries, and edible flowers (my favorite item of the course! ); and Tiana’s “fresh baked” Beignets. 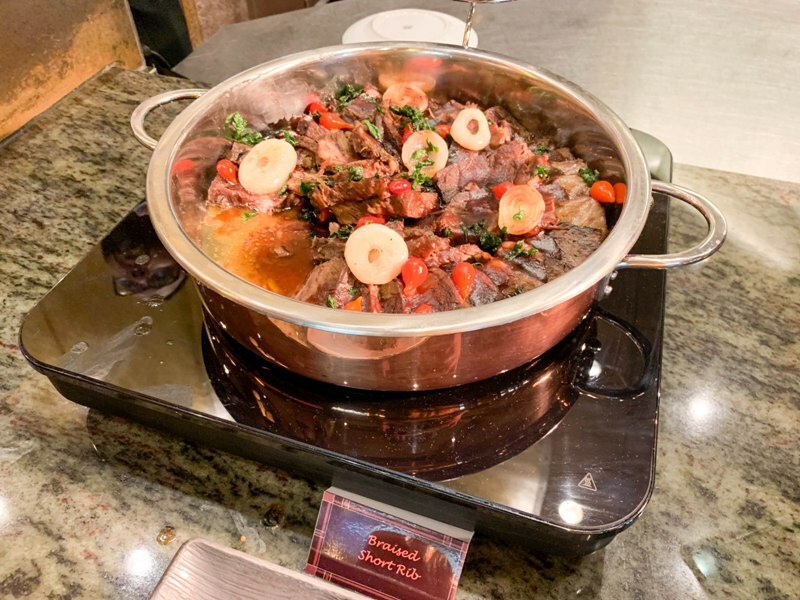 The main course is a buffet of hot entree items. Gone is the original menu of shepherd’s pie and bangers and ketchup caviar. 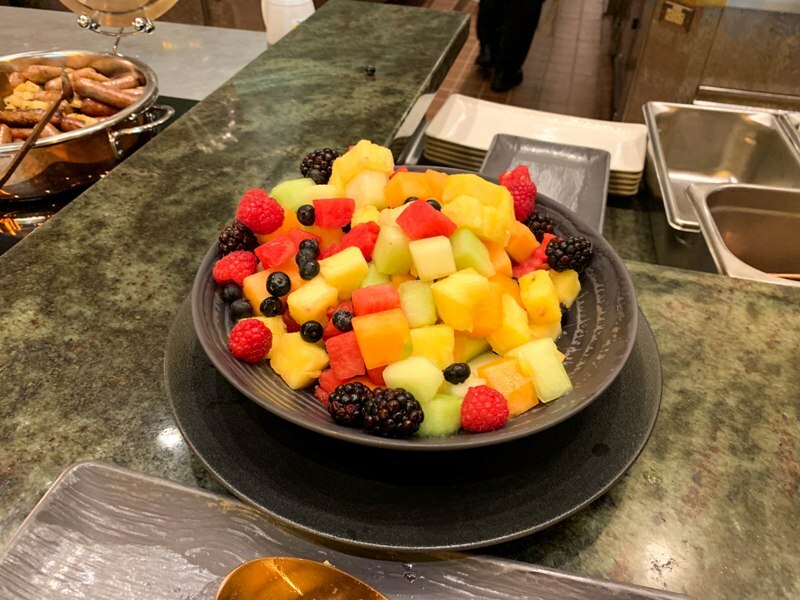 The buffet items, which are available for both kids and adults, are much closer to your standard buffet fare, although the quality is several steps above the other character meals at The Disneyland Resort. 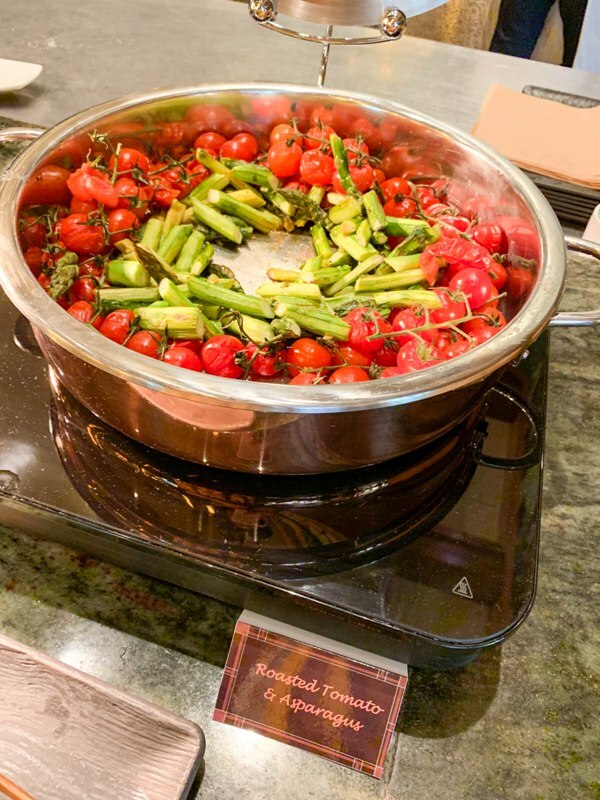 Our buffet selections included: “perfect scrambled eggs,” thick cut bacon, pork sausage with pineapple bits, fruit salad and fruit skewers, mini fried chicken and Mickey waffles, braised short rib, roasted vegetables (blistered tomatoes and asparagus), beef cheeseburger sliders, and mac and cheese. 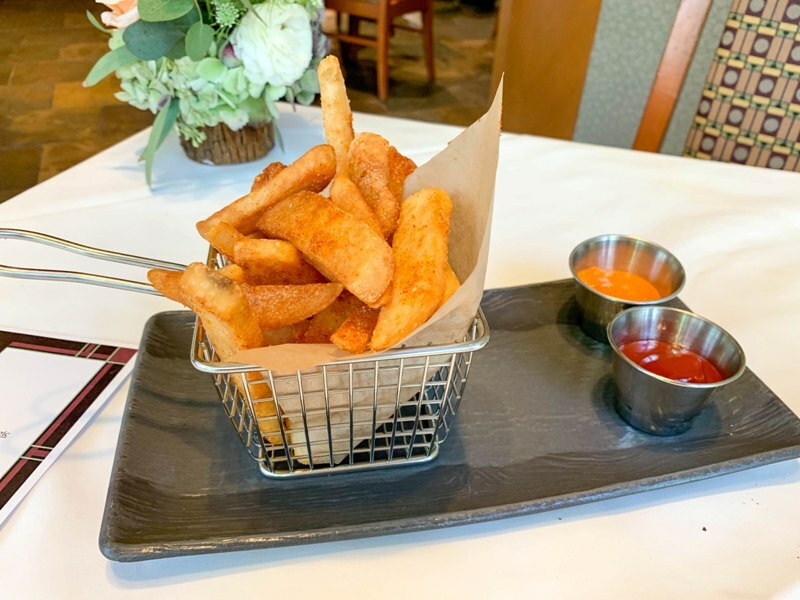 Once we were back at our table, Neaty brought out a basket of seasoned Papas Bravas (thick cut french fries) with two dipping sauces, ketchup and bell pepper Romesco. I really can’t say enough good things about the food at this experience. Everything was top notch and way above your standard character meal fare. 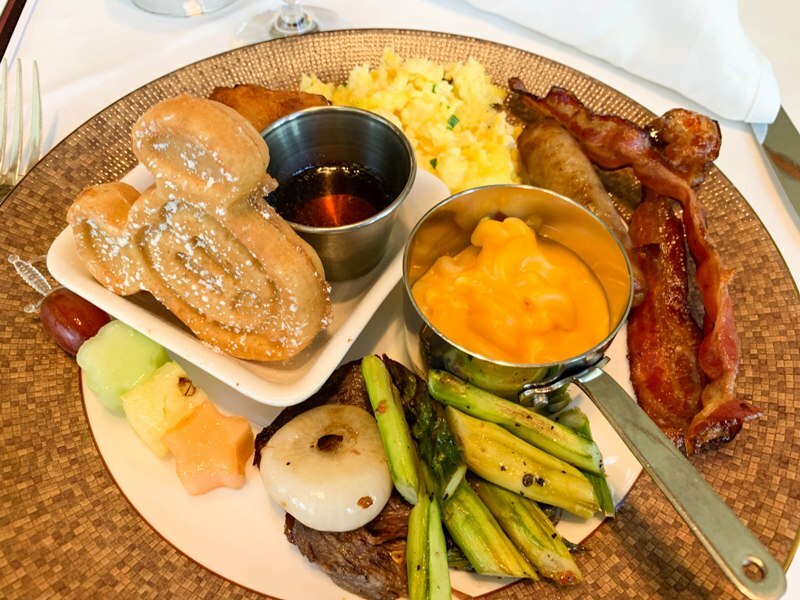 When this dining experience was announced I was most excited for brunch at Napa Rose, one of my favorite restaurants at The Disneyland Resort hotels. The food did not disappoint. 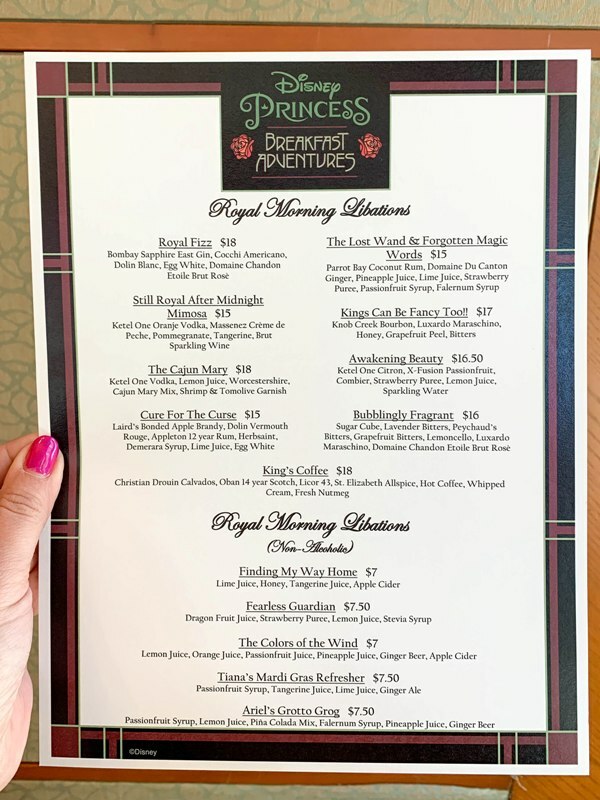 If this brunch was available on a regular basis without the princess interaction and a lower price point, I would come back again and again. 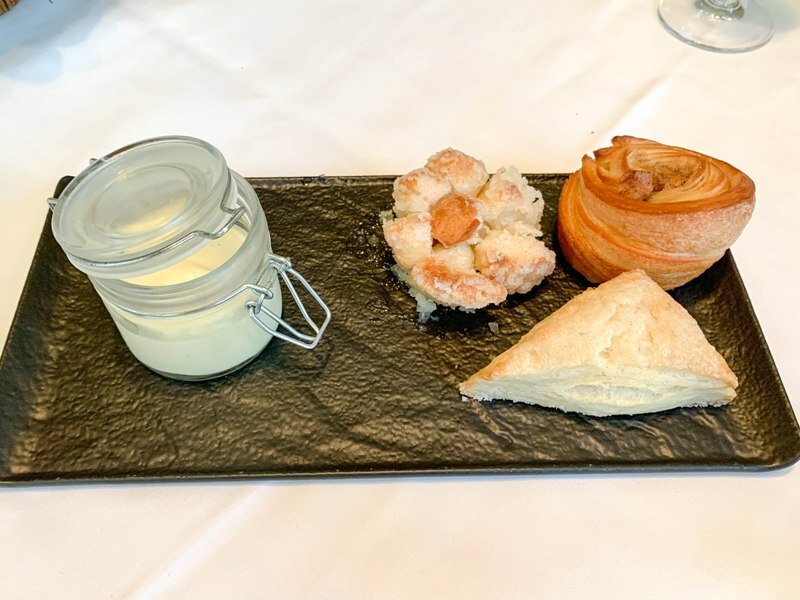 Once our buffet plates were cleared, the third course – a dessert tray – was delivered. Oh my gosh, this was the cutest part of the meal! 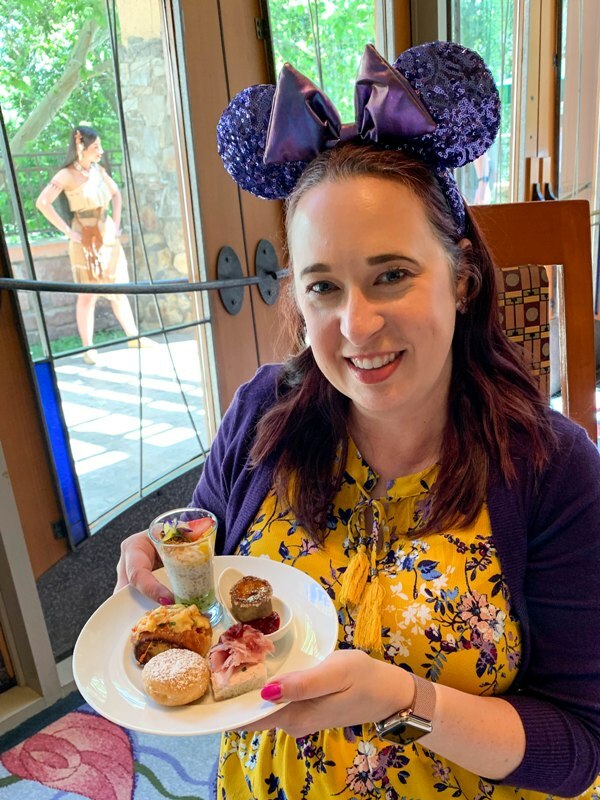 Every dessert item was princess themed, of course, and Neaty even sprinkled our desserts with magic sugar pixie dust. Desserts included: Pocahontas Peanut Butter Crunch (favorite! 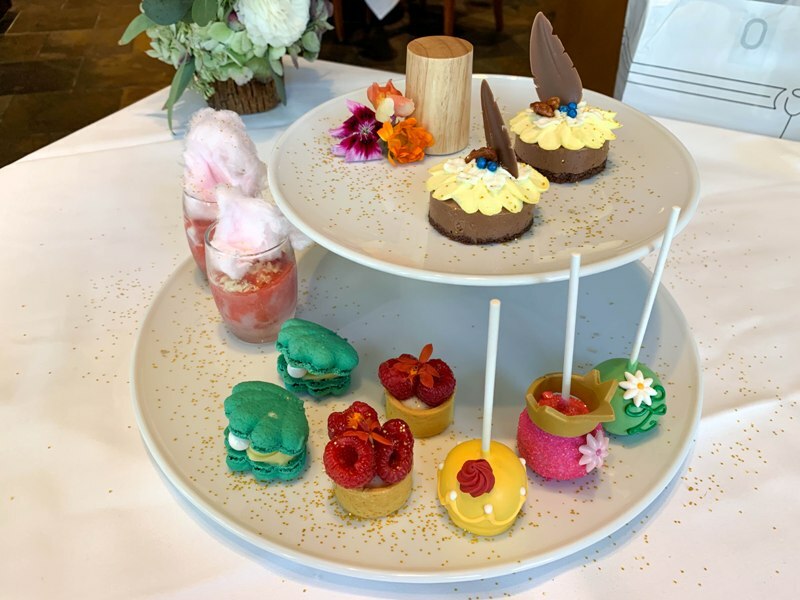 ), Mulan’s Firecracker Sorbet (strawberry sorbet topped with Pop Rocks and cotton candy), Ariel Shell Macarons, Belle’s Raspberry Tarts, and Royal Princess Cake Pops (plain chocolate cake inside). Throughout our meal, Disney princesses stopped by our table to chat and pose for pictures. 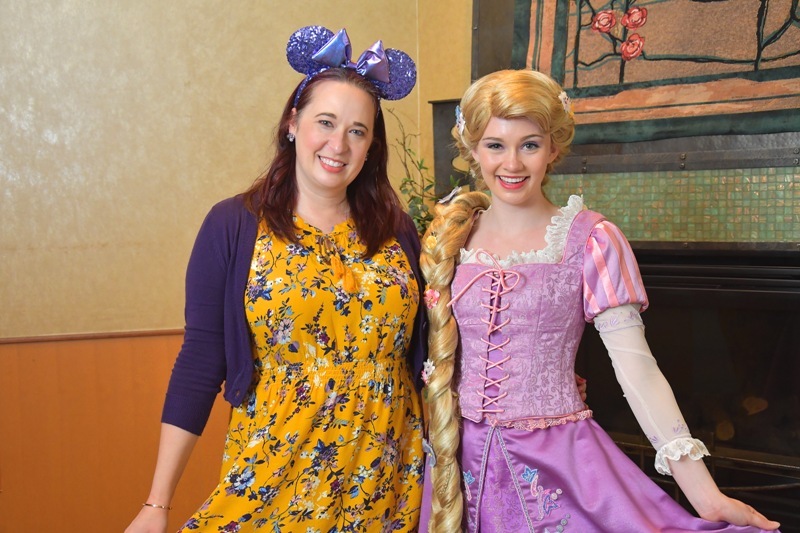 In some reviews, it is reported there is a princess in the lobby to meet with guests while they wait for our table. As I mentioned earlier, towards the end of our 40 minute wait in the lobby, Jasmine appeared and visited with a family at another table. We were led to our table before Jasmine could make her way to us. But Jasmine did come to our table shortly after we were seated. During our visit, we met with Jasmine, Aurora, Tiana, Belle, Mulan, and Rapunzel. 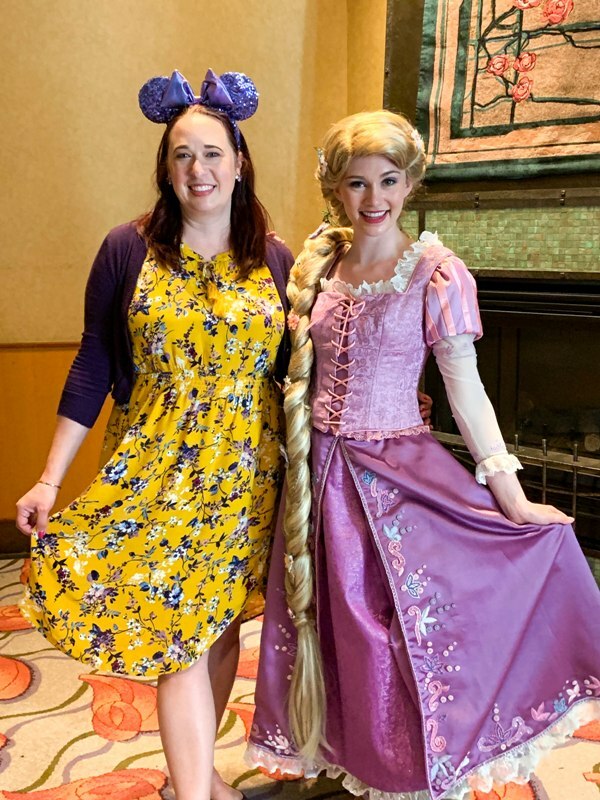 Part of the Disney Princess Breakfast Adventures experience includes meeting with two princesses outside on the patio for storytelling and lessons. Due to our late seating we didn’t get to experience this. 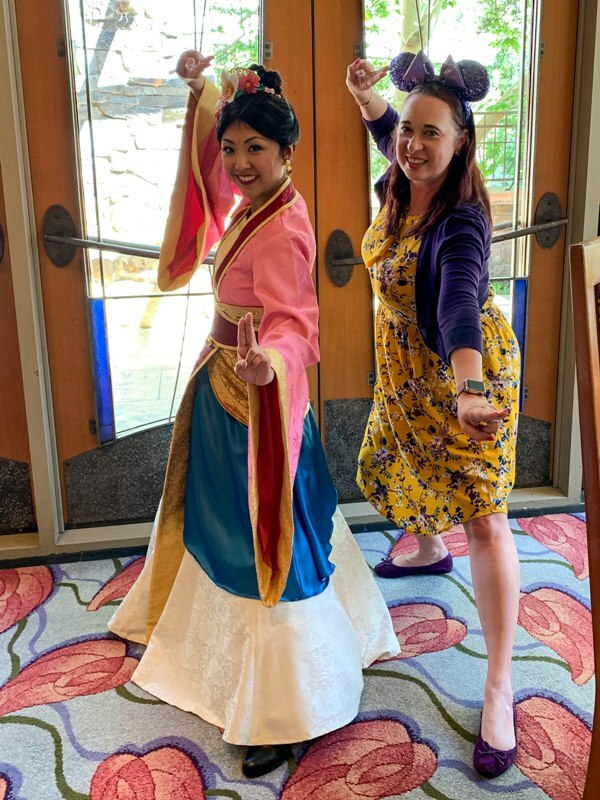 Instead, Belle and Mulan, who were outside, stopped by our table and visited with us. The visits felt very rushed and the Adventure Guides seemed to be hovering to try to wrap things up. 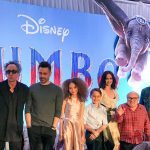 This is understandable, due to the laws and guidelines when it comes to Disney characters, but it certainly diminished the whole experience for me. Earlier in the meal, we saw Pocahontas outside through the window, and saw Ariel at other tables, but neither came to our table. 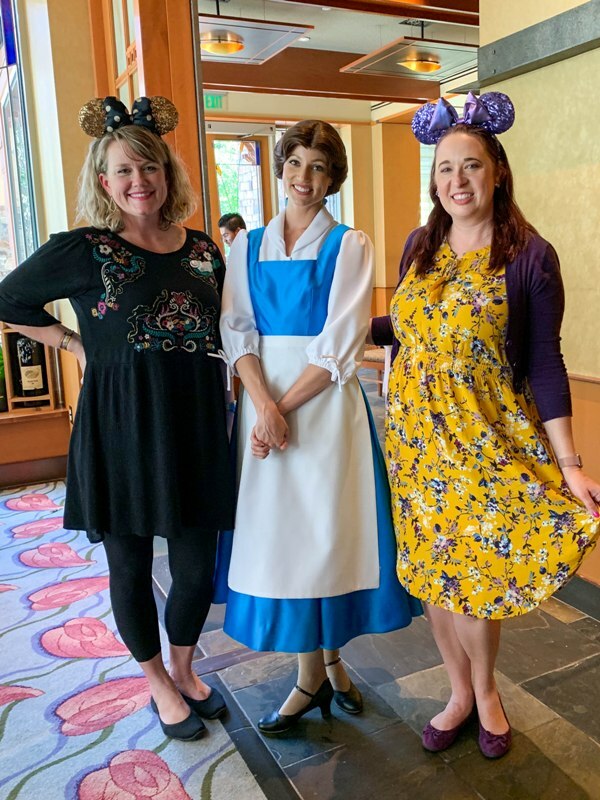 NOTE: Be aware the patio experience ends at 12:30pm, and the princesses are gone by 1pm. If your meal is running late, be sure to let your server know you want to experience the storytelling on the patio before it ends. You can stay and finish your meal past 12:30pm, but the princesses start to wrap up around this time. 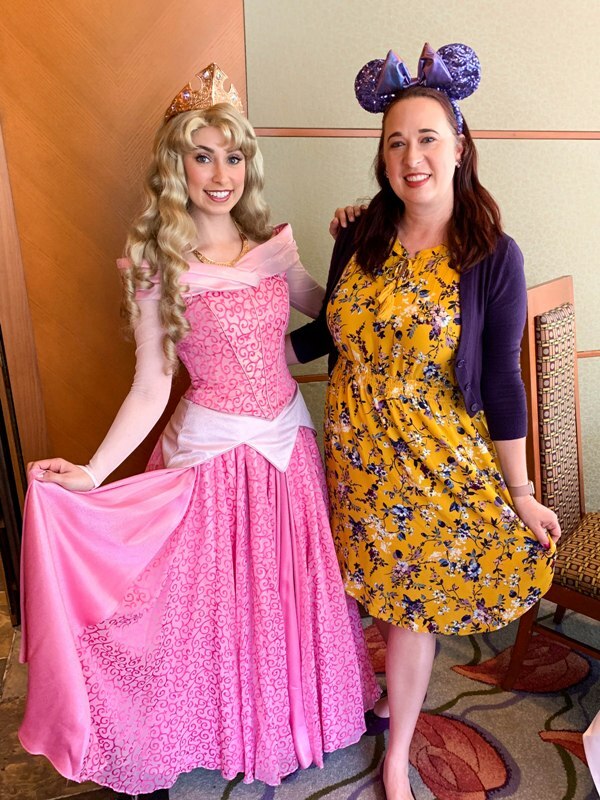 In a normal scenario, after the patio storytelling, you’ll be led into the photo room to get a complimentary PhotoPass photo with one of the princesses. Ours was Rapunzel. She was very lovely, but again it felt like we were rushed through our experience. PhotoPass will also take photos with your camera, but the PhotoPass images are included with the price so take advantage of that! 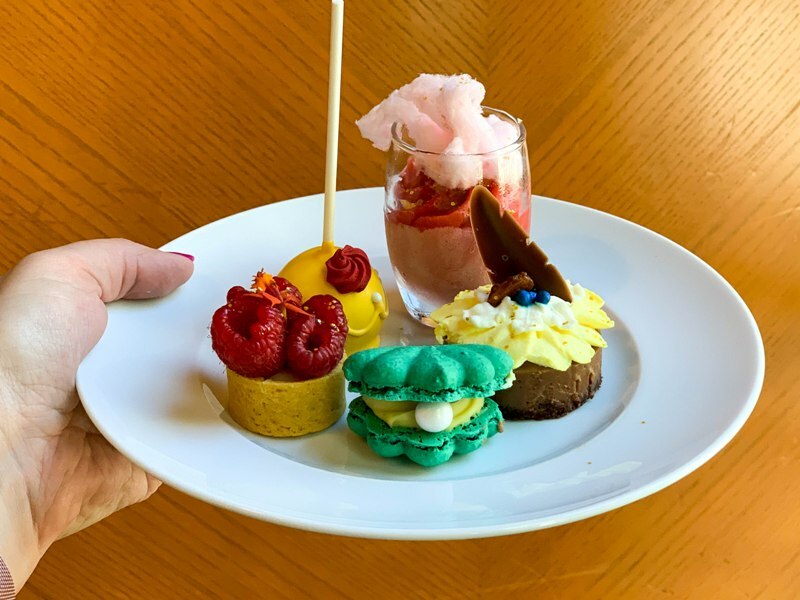 Once you are done with your desserts (and keep in mind Napa Rose can box up anything left on your plates), kids are given a parting gift. Children receive their choice of a crown necklace, or foam sword and shield, along with a cinch sack and truffles. In other reviews it sounds like adults also received a cinch sack and truffles, but we were not given this. NOTE: In the interest of full disclosure, towards the end of our meal a manager came over to our table, unprompted, and apologized for our late seating. Napa Rose ended up giving us a discount on our bill to make up for the diminished experience we received. We had no plans to complain or ask for a discount, but we appreciated the offer and thanked him for gesture. 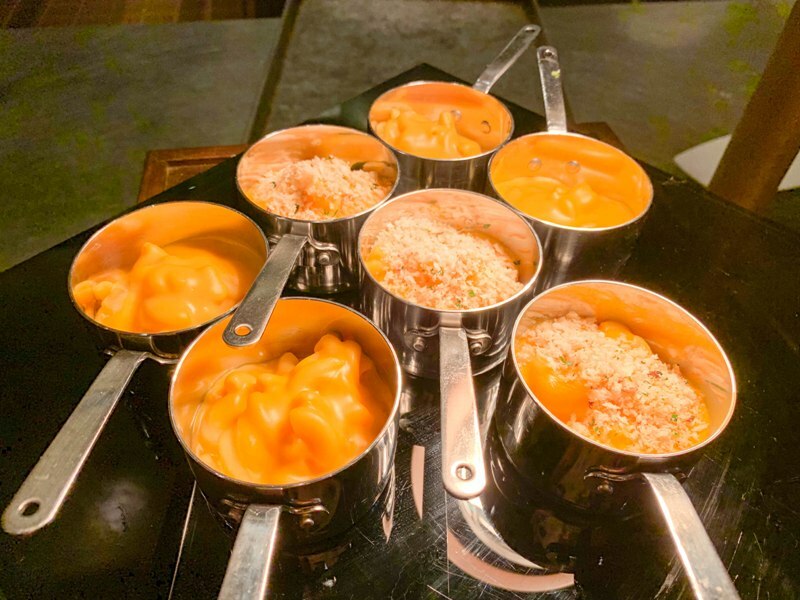 I really wanted to love this meal, and I think if everything had gone smoother I would easily say it’s worth the $125 price tag. Despite the hiccups, I do not believe Disney treats adult guests without children any different than tables with children. Neaty was incredibly delightful as our adventure guide, explaining all the different foods to us and which princess made them. She was very attentive to where we were at with our meals and drinks. As far as the princesses, some interactions were better than others. 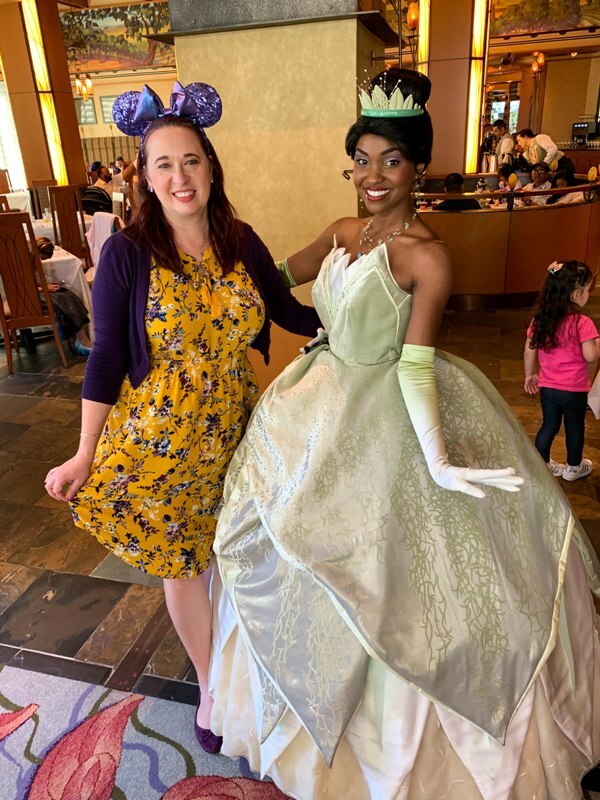 Tiana chatted with us for a while, commenting that she wanted us to invite her and Lottie for our next girl’s day out and wanted to drink mint juleps with us. Mulan asked us which kingdom we were from and offered to let us borrow her horse Kahn the next time we needed to travel. She also taught us different warrior poses. Aurora asked how we knew each other and we replied we met online, and she said sometimes meeting strangers can be a really good thing, like when she met Prince Phillip in the woods. 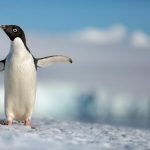 I mention all this simply to say, as two adults without kids we were still given lots of attention. 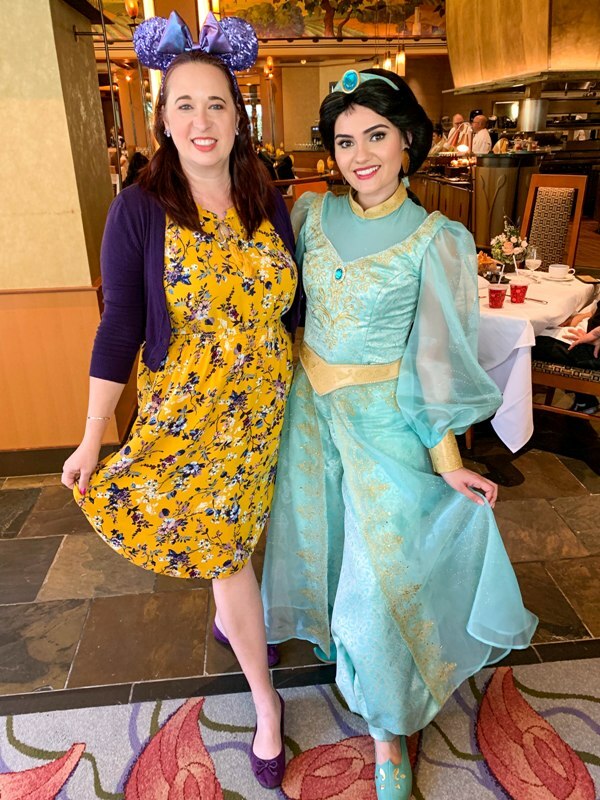 I think Disney Princess Breakfast Adventures would be a wonderful option for a bachelorette party, girl’s day, or even a special occasion date like a birthday or anniversary! 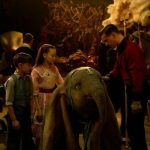 I’m hoping the opening week hiccups will be worked out, but for now I recommend making reservations for no later than 10am, and keeping an eye on the time so you don’t miss the outside storytelling. 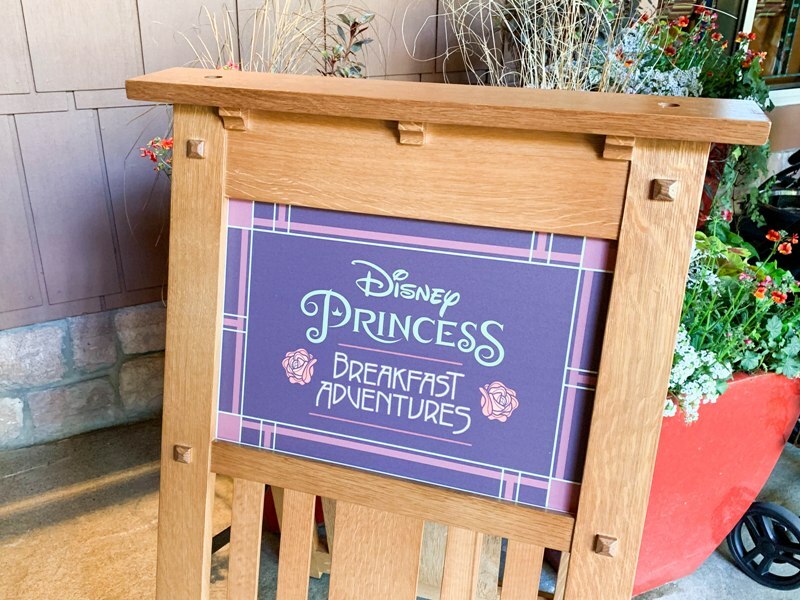 You can make reservations for Disney Princess Breakfast Adventures online here or by calling 714.781.DINE. 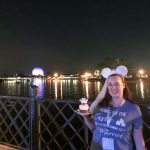 I can accept that stuff at Disney is very expensive, and I don’t mind paying for it if I think the experience is worth it. 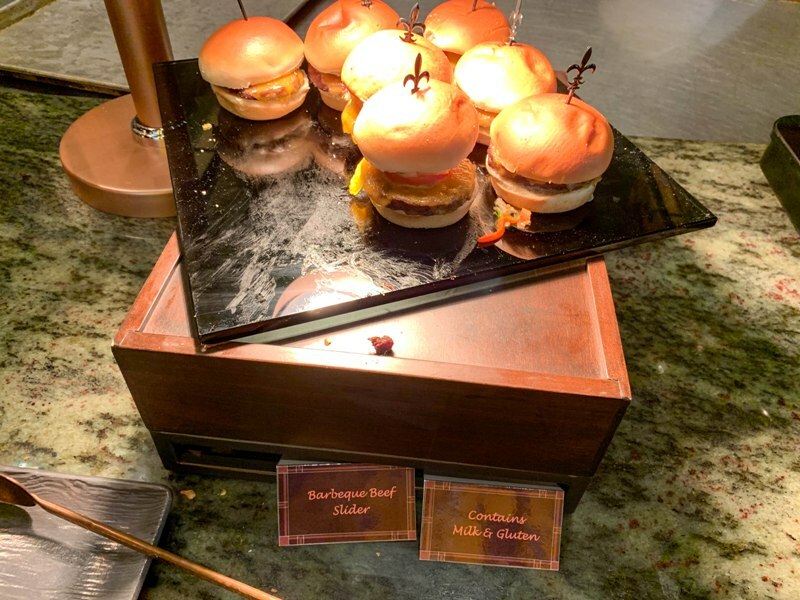 I just don’t think this would be for me personally – I’d rather save my money for the brunch in WDW at California Grill or Narcoosse’s, which had AMAZING food and unlimited drinks. The prices of those drinks is ridiculous! 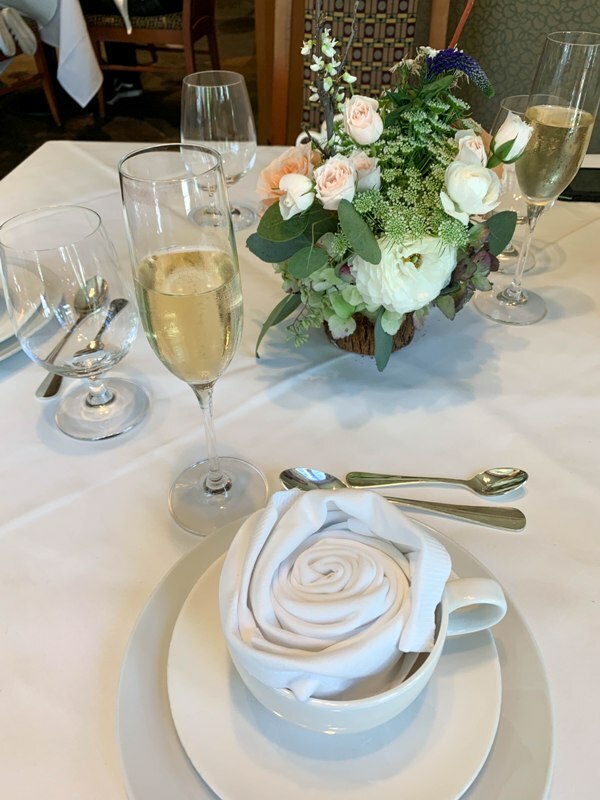 I will say the Chef’s Counter dinner I had at Napa Rose was the best meal I’ve ever had… I’d probably just rather use the money to do that and have a totally customized 6 course dinner instead. It’s funny you mention the price of drinks because that didn’t even phase me! A cocktail at Napa Rose is around $15 so I didn’t even think twice about it. In the interest of full disclosure, I am really curious as to the discount they provided you for having to kiss some parts of the experience. 10%? 20% ($25)? You are too kind. Some adults understandably thought that with flat-rate pricing, everyone, child or adult, got the same souvenirs. So some requested them and received them after being told that they “shouldn’t” get them. And I’ve seen bloggers who got to attend the media event for free get swag, too, further confusing people. 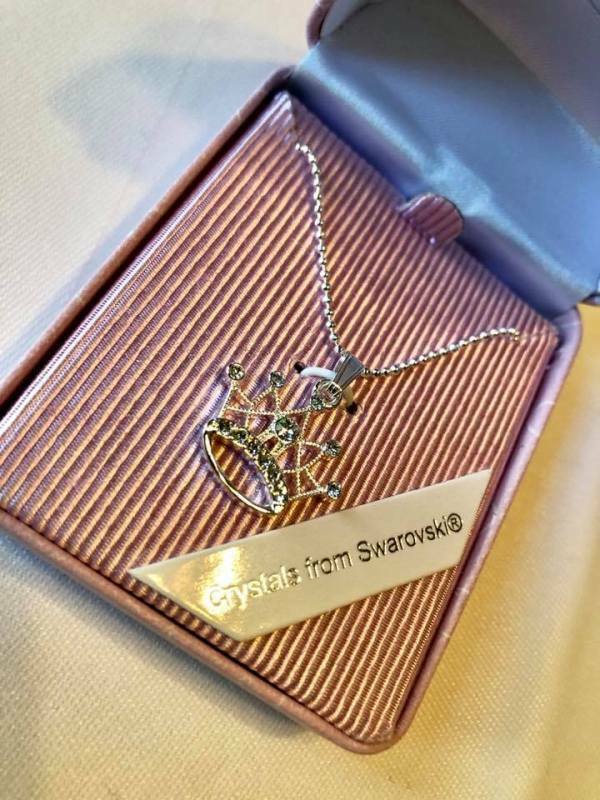 Thank you for the really clear, detailed photo of the necklace, the best I’ve seen (and I’ve been Googling all over every review I can find). It looks pretty nice! Too bad they won’t give one to any paying guest who wants one. What is the total price including tax and gratuity for two people ? 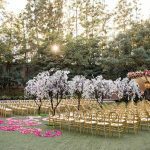 The price is $125 per person before tax and gratuity, and doesn’t include any extra alcoholic beverages. The current tax rate in Anaheim is 7.75% but subject to change. Gratuity is up to you but 20% is standard. Hope that helps! Yes, thank you and great review!